Welcome to this week's Thursday Cartridge Showcase! I hope you have all had a good and crafty week so far! Today I have a bunch of cards made with the Holiday Cakes Cricut Cartridge! They are all very simple cards, because I am a simple girl! I had a lot of fun making them. So, lets jump right into it! 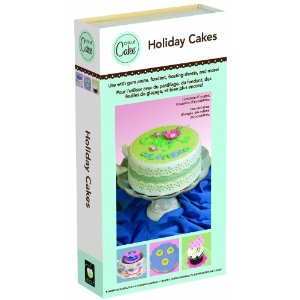 The Holiday Cakes cartridge has a really cute font, awesome boarders, and the perfect image for every occasion! I think it is important to know that the Cake Cartridges can be used in ALL of the Cricut machines! The images are all just two layers and so super easy to put together! The first card I made is for my cousin who is expecting and just found out that she is having a baby girl! I used the stork image to create this all pink card! This next card is a thank you I made for one of the birthday gifts I received. I used the elephant image and three different pattern papers! For this card I used the supper cute font included on this cart and one of the many many borders! For this simple note card, I used the spring wreath shadow! This is a card that I made for Madison's I Feel The Love Project using the star border! Provo Craft calls it a paisley! and Wednesday, March 7th for a CookingWithCricut.com Design Team challenge! Thank you Court for such a wonderful showcase. Thank you for letting us know that the Cake Cartridge can be used on all Cricut machines. These cards are all so different and amazing! All this from ONE Cartridge! Great job showcasing Holiday Cakes. The cake carts are all really versatile and have a lot of great cuts. Great projects! Love that "paisley" card. TFS!